Legend says that the Aztecs left their home to look for a place to start anew. Their god had told them to find a lake where an eagle with a serpent in its beak would stand on a nopal cactus, growing from a rock. After much traveling they found exactly what their god described and were sure it was the sign they had been seeking. Tenochtitlan translated means, “place where a cactus grows from a stone.” This symbol of the eagle with the snake on the cactus is the national emblem of Mexico and is proudly displayed on their flag. When the Spanish arrived in 1519, they could not pronounce Mextzlixcictlico, and so it was shortened to Mexico. In Spanish it is pronounced Mejico, with the j pronounced like an h. The country was ultimately named Estado Unidos Mexicanos or the United Mexican States. There are 31 States in Mexico, plus Mexico City, known as the Federal District. Mexico is located in the southern part of North America. It is bordered to the north by the United States of America (the second largest border in the Americas after Canada) and to the southeast by Belize and Guatemala. Baja California is a peninsula of arid land that extends between the Pacific Ocean and the Sea of Cortez. It is where the desert meets the sea. The mainland, as it is called, is surrounded by the Sea of Cortez and the Pacific Ocean to the west and Gulf of Mexico and the Bay of Campeche (formed by Mexico’s other peninsula, the Yucatan) to the east, as well as the Caribbean Sea. Mexico is the 14th largest country in the world by size. Mexico has something for everyone; it has a variety of geographical regions and climate variations, from high deserts and scrubland, to lush tropical jungles and 6000 miles of spectacular coastline. Central Mexico is mostly a volcanic plateau, surrounded by vast mountain ranges, running north to south. Mexico is located on the “Ring of Fire” and has suffered from several major earthquakes. Mexico City was built on top of the old Aztec capital and is actually sinking. The city is home to some 24 million people and is the second most populated city in the world. They consume about 287 billion gallons of water each year. However, because 70 percent of their water comes from the aquifer below the city, it has actually sunk, more than 32 feet in just the last 60 years. Mexico has an amazing history of notable ancient civilizations. This period is referred to as the Pre-Columbian period. There are at least five major civilizations that existed in Mexico: the Olmec, Maya, Teotihuacan, Toltec and Aztec. First populated some 13,000+ years ago, the country had complex indigenous civilizations long before the Spanish arrived in the 16th century. What these civilizations left behind, is why Mexico is home to over 30 UNESCO World Heritage Sites. There are places like the Pre-Hispanic towns of Chichen-Itza, Tulum, Teotihuacan and Uxmal, to the ancient rock paintings of the Serra de San Francisco and historic centers such as Zacatacas, Puebla, Morelia, Oaxaca, Monte Alban and San Miguel de Allende, to name just a few. Mexico was under Spanish rule for nearly 300 years. The Mexican people, led by a priest named Father Hidalgo, rose up against the Spanish on September 16, 1810. Hidalgo is considered to be the Father of modern Mexico and Independence Day is celebrated on September 16th each year. This date actually marked the beginning of the war. It was not until a decade later that Mexico declared independence from Spain, on September 28, 1821. Since her independence and through many civil wars and revolutions, Mexico’s borders are what they are today. It used to be a much larger country, incorporating a vast swath of the USA’s western states. The Spanish left an indelible mark on the culture of Mexico. Spanish is the language they speak and Mexico is the largest Spanish speaking nation in the world. They also adopted the Catholic faith and 88 percent of the population are Catholics. Many of their cities were built in colonial times with beautiful churches and town squares, called Zocalas, which make up the hub of activity in the center of the city. 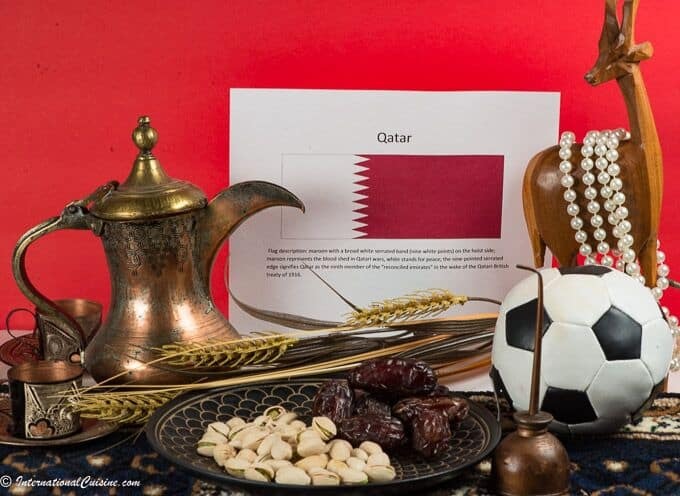 They have incorporated local religious practices and customs from the pre-Christian era into their celebrations and festivals. For example, the very popular “Day of the Dead” represents a fusion of All Souls Day, with rituals from earlier Aztec and Meso-American tribal customs. 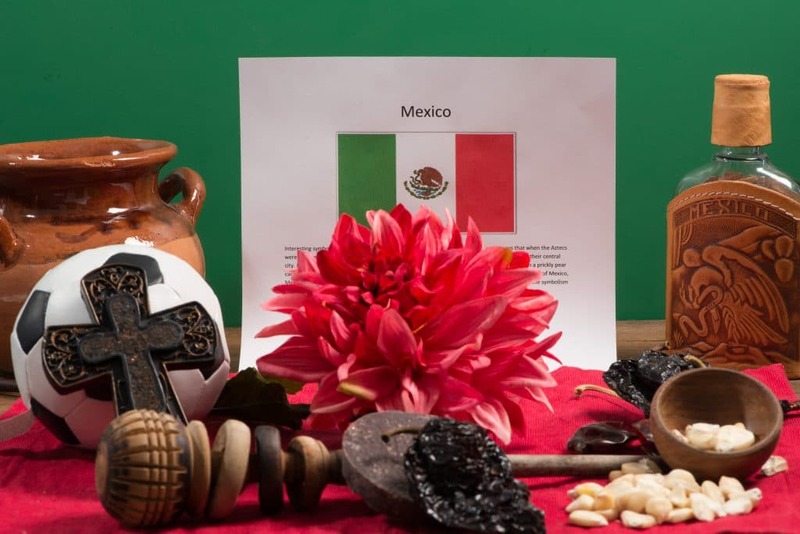 The largest ethnic group in Mexico is Mestizo, a mix of Spanish and Indian ancestry. The next largest group is the indigenous population, mostly Amerindian, who keep their unique customs alive and well. The constitution recognizes 62 indigenous groups living in Mexican territory and grants them autonomy and protects their culture and languages. Americans, Europeans, Africans and other immigrants from Asia and the Middle-East, make up the balance. As we look into the cuisine of Mexico, it is extremely varied by region. The north is famous for its ranch culture, where the most popular dishes are based on beef and goat. Dishes like machaca, arrachera (fajitas) and cabrito (baby goat) are famous. Cheese, in many varieties, comes from this region; including queso fresco, that is loved all over the world. Corn tortillas are ubiquitous throughout Mexico. However, the north has created at least forty different types of flour tortillas and created the burrito in Sonora, which has also become world renowned. Baja California is home to Mexico’s oldest wine region with a reputation for delicious wines. The north Pacific coast supplies much of the country’s grains, fruits and vegetables. The area is famous for pozole (an hominy soup), birria (a stew made of beef, lamb or pork with chili peppers and spices), menudo (made from cow intestines) and many pork dishes. Jalisco is famous for its tequila. Of course, seafood is abundant along the coast. It is generally cooked with chili peppers and European spices. The Bajio area is famous for its carnitas, (deep fried pork) originating from Michoacan. The area is also famous for its sweet desserts, like arroz con leche, (a rice pudding) and cajeta (goat’s milk caramel). The south Pacific coast, incorporating the area of Oaxaca, is famous for their indigenous cuisine. Chicken and pork are staple ingredients, along with seven different moles (pronounced mo- lays.) Chocolate is also used frequently, hand ground and combined with nuts and cinnamon for a delicious beverage. Corn is another staple food of the region and used in tortillas and there is a cheese similar to a string cheese, simply called Oaxaca cheese, made from this region as well. The food from the Yucatan region is based on Mayan food, with Caribbean influences. One of the main spices is achiote, which gives the food a reddish color. Recados, are pastes made with achiote and used on chicken and pork. Pibil is a cooking method used in this area where meat and vegetables are wrapped in banana leaves and cooked in a pit. This area also loves habaneros, a fiery chili that is typically served on the side. Tropical fruits are plentiful and used to make delicious salsas. The Gulf region of Tabasco and Veracruz, is a fusion of Afro-Cuban and Spanish cuisines. 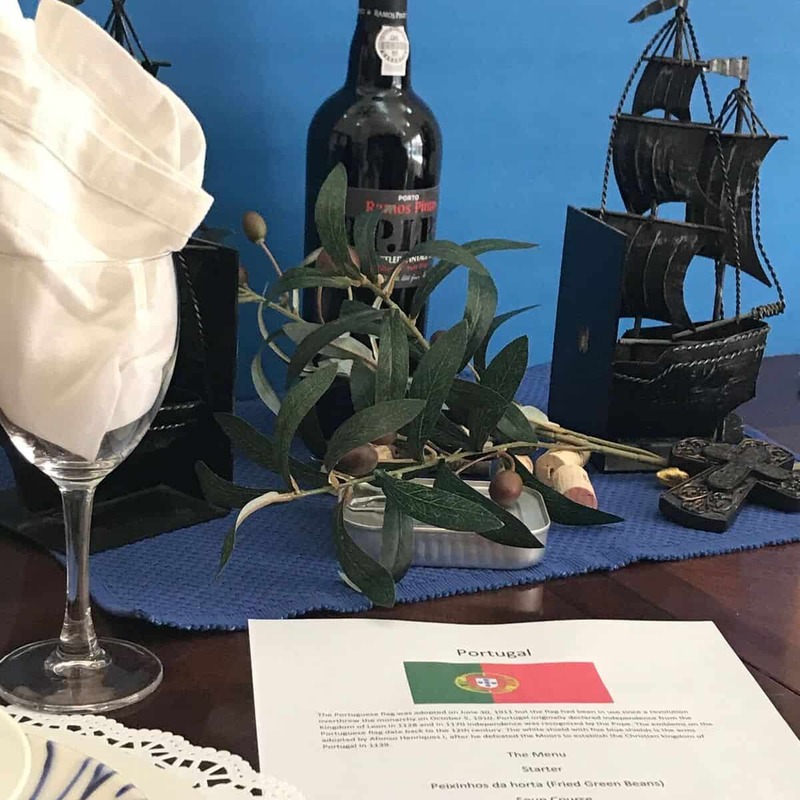 The Europeans introduced herbs to the region which are used to make dishes like, Huachinango a la veracruzana, red snapper, prepared in a tomato sauce, seasoned with bay leaf, onions, capers, olives and sweet yellow peppers. Yes, the beloved hot sauce, called Tabasco, comes from Tabasco. Dishes made with peanuts along with plantains, yucca and sweet potatoes are the Africans’ contribution to their cuisine. The whole area is teeming with seafood, used often in the dishes from this region. Central Mexico is where every type of Mexican cuisine can be found. Mexico City’s street foods are very popular, with taco stands and tortas (sandwiches) found on nearly every corner. You can find restaurants featuring pre-Hispanic food, to the latest haute, Mexican cuisine and every style of cooking in between. Corn, chocolate and chilies are just a few of the gifts from Mexico, to the world. We began our meal with one of my favorite things, typically found on a street cart, it is called, campachana. It is a seafood cocktail that is served with the broth in which the seafood is cooked. It usually has octopus, shimp, squid, scallops and sometimes oysters. 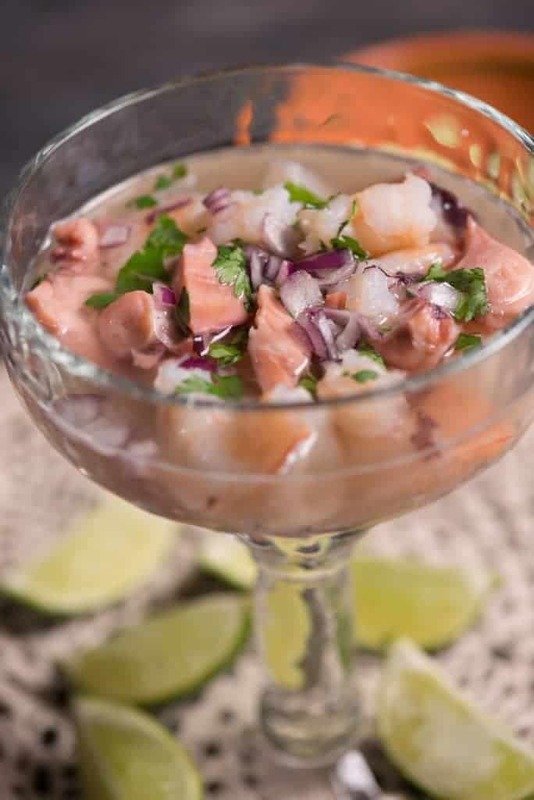 This is served in a cup and topped with cilantro, jalapeno, onions and lime. It is heaven in a cup. Next we had pozole, pronounced “po-so-lay”, a chicken (or often times made with pork) and hominy soup in a red sauce, that is popular all over Mexico. It is not always made with a red sauce, but this is my favorite style. The red comes from a combination of pureed dried chilis which impart a delicous flavor. Hominy is a giant, white corn kernel. When it cooks it almost appears as though it is blooming. It also gives wonderful flavor to the soup. 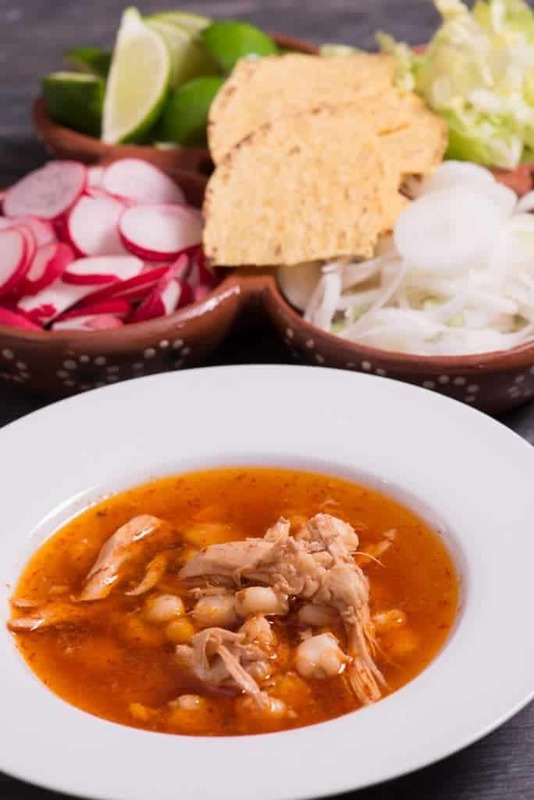 Pozole, whether white, green, or red, is always served with accompaniments: limes, radishes, chopped cabbage or lettuce, white onion and tostadas. Spices such as dried oregano, ground chili or a mexican mix, like tajin, are also on the table. For the main course, I chose to make a very old recipe, that was created for the a general and his men who were to fight for Mexican independence. The recipe comes from the nuns in Puebla. It is a complex recipe and I can not even imagine making this without a blender. Back then they would have ground the walnuts for the sauce using a metate. It must have taken them days to prepare. This dish features the colors of the Mexican flag; the walnut sauce being white, pomegranate seeds for the red and parsley for the green. It is therefore a favorite for Independence Day celebrations, when pomegranates come into season. 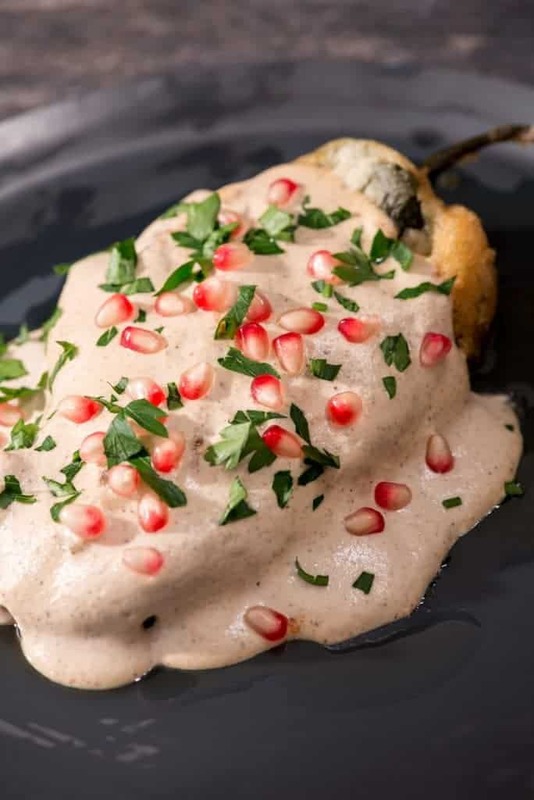 Basically, this dish is a poblano chili stuffed with meat, fruit, nuts and an array of spices, all mixed together called picadillo. It is then fried in an egg batter and topped with the walnut sauce and garnishes. Honestly, this recipe was so different from any chili relleno we have ever had, I was not sure what to expect. All I can say is that those nuns had divine inspiration. The complexity of flavors and textures in this dish can be summed up in one word, Sublime! 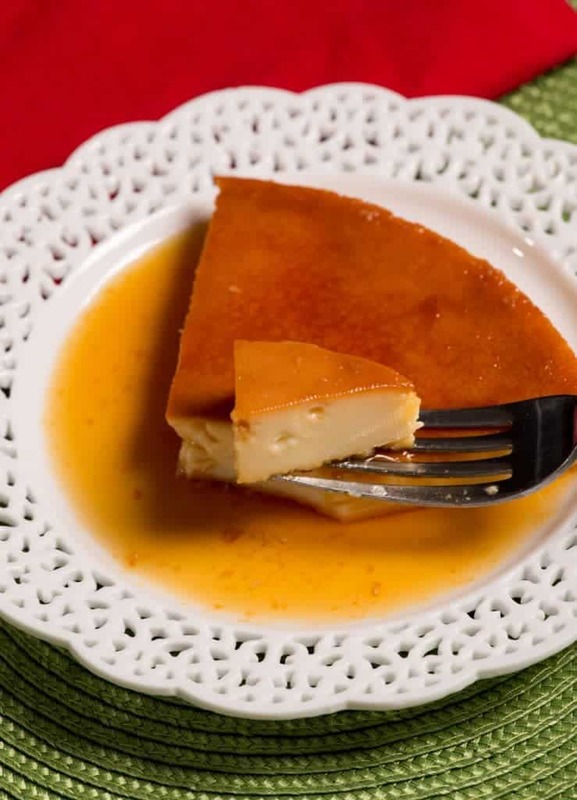 For dessert we served one of the most widespread delights, flan; a delicious egg custard with caramel sauce. It is extremely popular all over Mexico, and the world, and was a wonderful ending to our most amazing Mexican meal. Growing up and living in Southern California, Mexico was a place that along with my husband I often visited. We had many interesting adventures there. In fact, we were even married at the Twin Dolphin Hotel in Cabo San Lucas, 28 years ago.